Solar Choice now has its own electric vehicle–the first of its kind ordered and purchased in Australia. 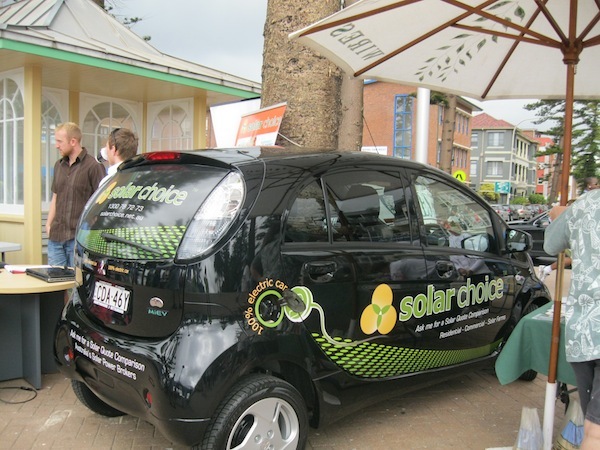 The Mitsubishi i MiEV (“Mitsubishi Innovative Electric Vehicle”), will be parked and charging its batteries in the evening in Manly, NSW when it is not being used on official Solar Choice business. Those living in Sydney will be able to see Solar Choice’s new wheels cruising around the city. In addition to being CO2 emissions-free, the i MiEV is also noise-free: Although its decals and odd shape make it hard to miss when it drives past on the street, the vehicle makes virtually no sound while in operation, proving disconcerting for driver and pedestrians alike. 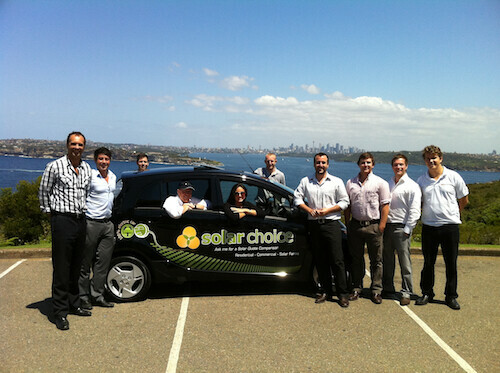 The above claim to having ‘Australia’s first 100% electric vehicle’ does come with some qualification: Solar Choice’s i MiEV is the first volume-produced Electric Vehicle (EV) ordered and sold on Australian soil. Although other models of EVs (such as the high-end Tesla roadster) have already arrived in Australia, the i MiEV is the first EV on the Australian market that has been mass produced and is relatively affordable. At around $50k AUD, it isn’t as cost-competitive as a many cars on the market (although the price will doubtless come down as EVs become more common), but the car offers significant savings on the cost of fuel. i-MiEV owners will save hundreds or thousands of dollars in petrol per year, as the vehicle can be charged overnight on off-peak rates of 6c/kWh, totalling less than $1, on which the vehicle can be driven for up to 160km. –High-capacity, high-energy density litium-ion batteries means versatility in fuel sources. Having batteries instead of a fuel tank means that electricity is drawn from the electrical grid. In Australia, this of course means that power is ultimately sourced from fossil fuels (i.e. coal), but even taking this into account, the i MiEV only produces 30% of the emissions of a standard petrol-powered car of the same size. What’s more the electricity that charges its batteries need not necessarily come from the grid–if the car is charged using only a solar car port, or during the day at a home with large solar power array, for instance, then the electricity powering the car will be totally CO2 emissions-free. –A 3-way battery charging system: two slow-charge modes (100V and 200V, 7-14 hours charge time) which can be accessed via any conventional home or car park power point, and one fast-charge mode which can have the ‘tank’ 80% full in 30 minutes using a specialised EV charger not yet widely available in Australia. –Unusual chassis layout: The i MiEV is the 100% electricity-powered version of the Mitsubishi i, the company’s innovative and popular ‘minicar’ with an unusual ‘rear-midship’ design–its engine sits underneath the rear seat of the car, as opposed to in the front under the bonnet. This feature of the i’s design made it ideal for the placement of the batteries required to power the EV version’s electric engine. The fact that the i MiEV’s engine is powered by its battery as opposed to petrol allows it to be much smaller than it would be with otherwise–conveniently leaving room for all the parts that cannot be found in conventional automobiles–an inverter, a charger, and the battery bank. –A small, high-efficiency motor that takes up much less space–and provides more torque–than a petrol-fired engine of comparable size. The i MiEV has surprisingly good pick-up for car with such a small engine! –Regenerative charging: The i MiEV’s re-channels the power produced in rolling downhill and braking to charge the car’s battery. The energy produced during long descents, for instance, can be seen on a ‘power meter’ on the car’s dashboard. Are Electric Vehicles the future of personal transportation? 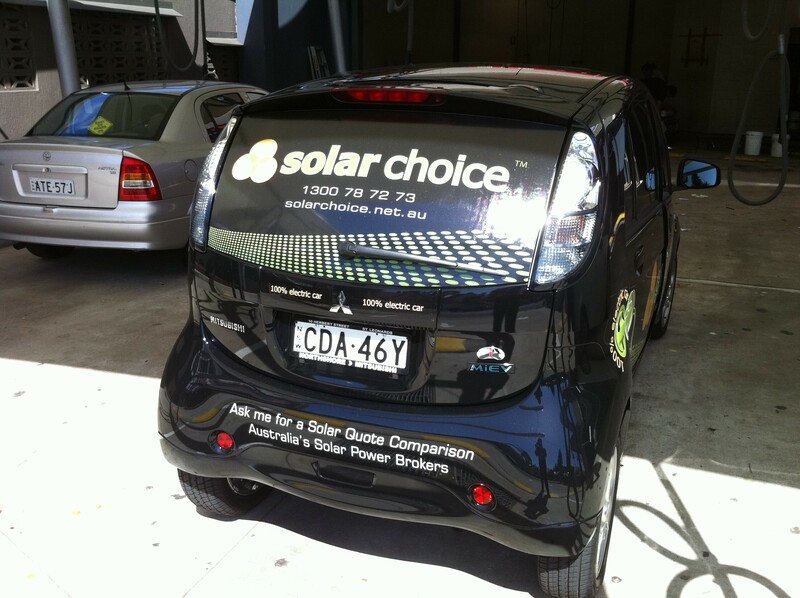 Solar Choice’s EV may be one of the first of its kind on the road in Australia, but as production capacity and demand for similar vehicles increases globally, they will undoubtedly cease to garner much attention. Much like the Toyota Prius petrol-electric hybrid went from head-turner to commonplace since its introduction in 1997, emission-free cars like the i MiEV, in an ideal world, will become a common sight. In fact, Chevrolet/Holden, Ford, and Nissan, plus a handful of other companies all have EV models in their product lines. In addition to replacing fossil fuel-based automobiles from the road, EVs could potentially revolutionise the way that electricity is stored and distributed in the grid, and make the relatively erratic nature of renewable energy production harnessable–if there were thousands or millions of EVs in operation in a nation, resting cars’ batteries could be used as a repository for electricity produced from solar power systems, and owners could be paid for the electricity drawn from their cars’ batteries into the grid at peak demand times. Technology like this is still a long way off, and will require a fair amount of forward-planning by governments and/or private grid owners–so let’s not hold our breath. Some private enterprises are already looking into ways to make this vision a reality: as we have written previously, developing grid infrastructure to accommodate renewables is one of the aims of companies like Better Place. See the article about Solar Choice’s new ride in the Manly Daily. Will Australia Build it’s own Electric Car, or just adopt one from another Country, And call it Australian. 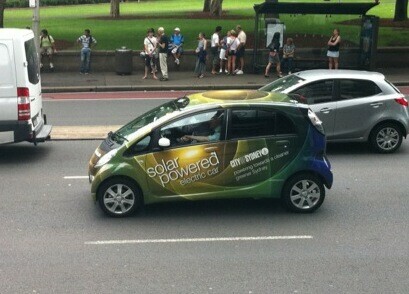 All the so called Electric Cars in Australia seem to be Hybrids. NOT Full Electric.